Sunset Landing is a waterfront, park-like wedding venue located in Waterford, Connecticut. Located in Mago Point, the venue overlooks the beautiful Niantic River as it empties into the Niantic Bay. Evening weddings are a favorite at this location, as the sunset provides a breathtaking backdrop for wedding ceremonies, receptions, bridal showers, engagement parties, and rehearsal dinners. 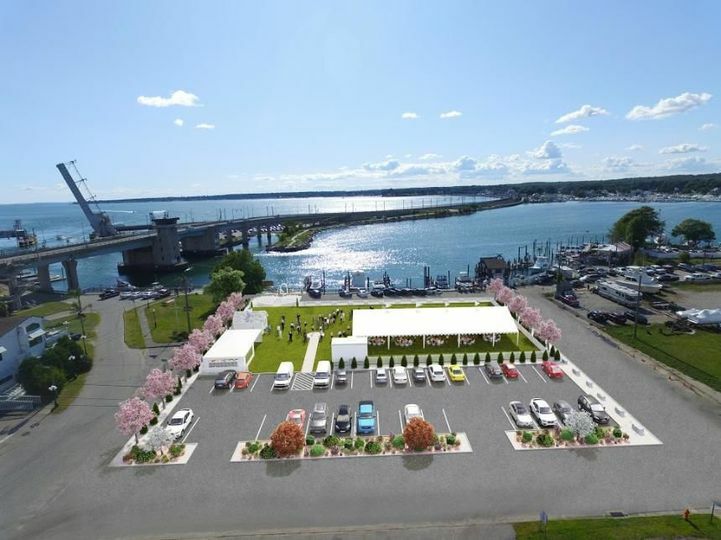 The green, grassy area is set right on the waterfront and marina, and features an open outdoor space as well as an event tent capable of accommodating up to 200 guests. Couples booking Sunset Landing will have access to the get-ready rooms and on-site parking. The venue can provide all-inclusive packages, bar services, and catering services. While couples are welcome to use outside vendors, Sunset Landing does require them to be chosen from a preferred vendor list. Sunset Landing is a part of Mago Point, where high-quality food and vegan options are considered paramount to their excellent customer service. Cuisine can be supplied in buffet, family-style, plated, or stained serving styles, with tastings scheduled prior to the event to sample and choose a desired menu. Hors d’oeuvres for a cocktail reception can also be crafted, as well as dessert offerings. Couples are welcome to provide their own cake from an outside bakery.